There once were two apples, one grown in Ontario and one grown in California. Both apples were delivered to an Ontario grocer and purchased by consumers for a dollar each. The dollar from the Ontario apple was used by the grocer to the pay the distributor, who paid the Ontario farmer, who paid his farm staff, who bought movie tickets in Ontario, and the movie theatre paid contractors to renovate the building, and so on. The dollar from the California apple was used by the grocer to pay the distributor, who paid the importer, who paid the wholesaler. Along the first supply chain, the apple dollar from the locally owned Ontario farm recirculates and exponentially multiplies throughout the local economy. Conversely, part of the apple dollar from the California farm leaves Ontario when the businesses involved in bringing the apple to Ontario are paid. Those businesses are often owned by shareholders around the globe, and that portion of the apple dollar goes into global financial markets. At the same time, Ontario loses out on all of the ways that money could have created growth in Ontario. This phenomenon known as the multiplier effect will be explored here. 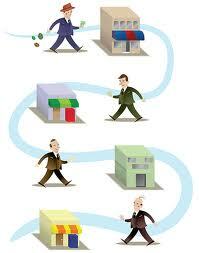 The multiplier effect is the amount of local economic activity that is triggered by the purchase of any one item. [i] Community economics tells us that the more a dollar circulates in a defined region, and the faster it circulates, the more income, wealth and jobs it creates. [ii] Hence the example of the Ontario apple supply chain. An important distinction to be made is that between locally-owned, entrepreneurial businesses, and publicly-traded corporations. When we refer here to locally-owned businesses we do not mean agri-food corporations whose profits are distributed to shareholders in the global market, but those whose profits remain in the region. This argument is meant neither to negate the importance of jobs created by importing in Ontario nor the competitive advantage and ability of other countries to grow certain products that Ontario cannot. Certainly, Ontarians enjoy their morning coffee and the availability of strawberries year-round. But it is redundant trade – the importing of products readily available locally – that we should reconsider in light of the multiplier effect. Given these statistics, one might ask what difference it makes whether a dollar circulates within a community or between communities, since global trade makes countries and regions ever more interconnected and interdependent. What’s the difference whether my apple dollar creates growth in Ontario or California? For example, in a study of Martha’s Vineyard it was found that importing certain products (some of which are food items) that the region could be producing itself, made seasonal unemployment a grave problem. If those products identified were produced locally, it was estimated that seasonal unemployment could decrease by 6%. [ix] Initially, producing locally may be more expensive for the Vineyard than importing – or economically less efficient – but consider the possibility that this initial inefficiency could be made up for by the job creation, decrease in seasonal employment insurance payouts and ever multiplying local circulation of money. Similarly, a Minnesota study found that if area consumers were to buy 15% of their food from local sources, it would generate farm income equal to two-thirds of the farm subsidies currently paid out in the region. [x] Examples like this show that, despite the allure of cheap imported food, we may actually be paying more for it in other ways. The second reason that we should care about our food dollars circulating in the local economy is environmental. We are highly dependent on fossil fuels to both produce and transport our food, especially because we are accustomed to the availability of out-of-season foods year round. [xi] When we buy local and in-season foods, fewer resources are used in their production and transportation, and our food is fresher once it gets to our plates. Buying local also acts as food systems education, making us more aware of which foods are available locally during which seasons, and helps us work toward a fundamental shift in our thinking about food. The mainstream food system currently works on supply chain management, where the primary focus is the flow of products from source to destination with maximum efficiency and minimum waste. Local producers are better able to survive when the food system functions on value chain management, or the value created in the eyes of the consumer at each level of production. [xii] Where the supply chain focuses on operational efficiency and costs, the value chain focuses on innovation and product development based on consumer demand. [xiii] A focus on the value chain helps make the case for equitably-produced local food when, for example, we realize the painfully low wages paid to those who produce, pick and package our imported food abroad. When our thinking about the food system is based on supply chain management, there can be a degradation of salaries, working conditions and environmental standards. When each level of the commodity chain is valued and understood by consumers they are more likely to pay fair prices for food that makes farmers better able to survive and works to eliminate the degradation of the aforementioned standards. As appealing as the multiplier effect argument is, it does not go unchallenged. Decentralizing the agri-food system and relocalizing production and processing may result in decreased efficiency if economies of scale are lost. [xiv] This means that the ideal situation is an interaction between the supply chain and value chain. A situation in which the consumer understands and attributes value to processes of quality (and equality) bringing food to their plates, and in which food producers can operate at maximum efficiency, achieving economies of scale. A secondary consideration, and subject for further research, is that the potential loss of economies of scale in local food distribution systems is made up for in the job and wealth creation of the multiplier effect of buying local. Energy usage presents another challenge. Though food bought locally is not travelling thousands of kilometers as in the mainstream food system, large amounts of energy may still be used moving a larger number of small vehicles. [xv] Lastly, issues of equity do not escape Ontario where we continue to face challenges in providing adequate wages and working conditions for migrant labourers. Thus, the argument for local food leaves many questions for further research including what scale a local agricultural enterprise needs to be at to be profitable, and how best to get consumers to value the source and practices involved in growing, distributing and processing their food. Feller, A., Shunk, D., Callarman, T. 2006. “Value Chains Versus Supply Chains.” Published Online. (Business Process Trends). Harry Cummings and Associates. 2009. “Temiskaming District Agricultural Economic Sector Profile.” Published Online: http://hcaconsulting.ca/pdfs/2009%20Temiskaming%20District%20Agri%20Economic%20Impact.pdf. Harry Cummings and Associates. 2012. Projects: Agriculture and Rural Development. Published Online: http://www.hcaconsulting.ca/Projects/AgricultureandRuralDevelopment.aspx. Meter, K. 2008. “Local Food as Economic Development.” Minneapolis, Minnesota. (Crossroads Resource Center). Meter, K. and Rosales, J. 2006. “Finding Food in Farm Country: The Economics of Food and Farming in Southeast Minnesota.” Lanesboro: Community Design Center Hiawatha’s Pantry Project. Miller, S. 2010. “From Land to Plate: The Dilemmas and Victories of Alternative Food Distribution in Ontario.” Published Online. (Sustain Ontario and the Ontario Culinary Tourism Alliance). Ogryzlo, L. 2012. “$10 Challenge, Billion Dollar Impact.” The Ontario Table. Available online: http://www.ontariotable.com/10-challenge-billion-dollar-impact/. Shuman, M. Undated. “Economic Impact of Localizing Detroit’s Food System.” Ann Arbour, MI. (Fair Food Foundation). Shuman, M. 2010. “The Competitiveness of Local Living Economies,” in The Post Carbon Reader: Managing the 21st Century’s Sustainability Crisis. (Eds. Heinberg, R and Lerch, D.) Healdsburg, CA: Watershed Media. Shuman, M and Hoffer, D. 2007. “Leakage Analysis of the Martha’s Vineyard Economy: Increasing Prosperity through Greater Self-Reliance.” (Training and Development Corporation). Swenson, D. 2009. “Investigating the Potential Economic Impacts of Local Foods for Southeast Iowa.” Ames, IA: Iowa State University. (Leopold Center for Sustainable Agriculture). [ii] Shuman and Hoffer, 2007. [iii] 1.4 in areas where large-scale farms prevail and 2.6 where small-scale farms prevail based on an Iowa State University study. Meter, 2008. [vi] Harry Cummings and Associates, 2012. [vii] Harry Cummings and Associates, 2009. [ix] Shuman and Hoffer, 2007. [xii] Feller, Shunk and Callarman, 2006.